The launch of Wonda’s Italian Latte in June 2018 has been overshadowed by the brand’s FIFA campaign featuring the three limited-edition Wonda Coffee 100% Arabica range, made with premium beans from Brazil, Peru and Colombia. The new Wonda Italian Latte (200ml) is the first Wonda RTD coffee in aseptic carton packaging supplied by SIG Combibloc. Based on a per serving size of 100ml, total sugar is 5.8g, protein 2.1g and fat 1.2g. The 200ml aseptic carton Wonda RTD coffee is priced at myNEWS.com at RM 2.20. As a comparison, the other range of Wonda in 240ml can is selling for RM 2.80 and Wonda in 340ml PET is at RM 4.20. 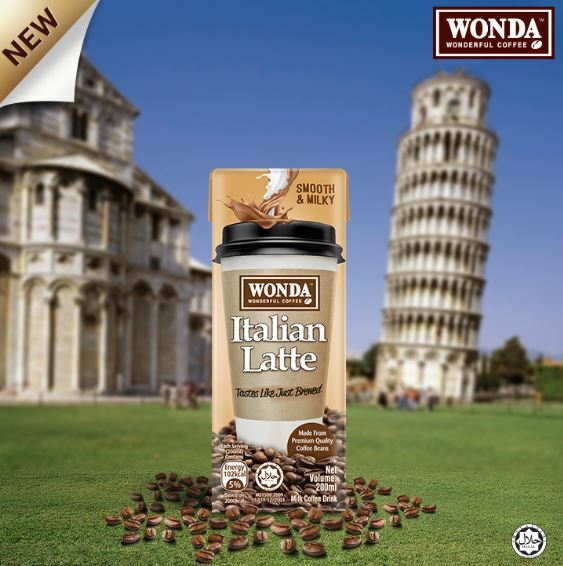 Wonda Italian Latte is now available at myNEWS.com and Shell.